Routine vaccinations for kittens between 6 and 16 weeks of age as a series of vaccines are recommended. The first set of vaccines should be given when the kitten is 6-8 weeks old. Cats that go outdoors need more comprehensive protection compared to indoor only cats, but all adult cats should get vaccine boosters at least every 3 years. Vaccinations have saved the lives of millions of cats formerly lost to common illnesses. Vaccinations for cats have saved the lives of millions. Before the days of effective vaccines, cats routinely died from Panleukopenia (Feline Distemper)and complications of upper respiratory (Herpesvirus, Calicivirus) infections. Newer vaccines are available to protect against Feline Leukemia virus infection (FeLV) and Feline Immunodeficiency virus (FIV). Current vaccination programs also protect our cats (and us) from the threat of rabies. All kittens should receive FVRCCP, which is the Feline Viral Rhinotracheitis, Calicivirus, Chlamydia and Panleukopenia, the so-called “4-in-1” upper respiratory or Distemper vaccine. Additional vaccines include FELV (for Leukemia), FIV (for feline AIDS) and Rabies vaccine. For kittens between 6 and 20 weeks of age, a series of vaccines is recommended. The first set of vaccines should be given when the kitten is 6-8 weeks old, and continue every 3 to 4 weeks until the chance of contracting an infectious disease is very low (typically the last booster is given between 16 and 18 weeks of age). A kitten may be lethargic for 1-2 days and show decreased appetite after the vaccinations. Occasionally, tumor development can be triggered by vaccination. It should be understood that, with very rare exception, the benefit of protection from disease by the vaccine far outweighs the chance of tumor development. Talk with your veterinarian regarding follow-up cat vaccinations. 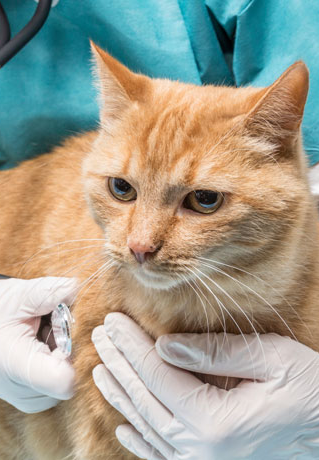 To learn more about vaccinations, how and when they are administered, and which cat care vaccines are suitable for your pet, visit our clinic at: 3995 Hastings Street, Burnaby, BC, V5C 2H8; or call us at: 604-291-6666.